This is a Zelda clone if there ever was one. Right down to a desert style imitation of the lost woods. This is not a bad thing though. In fact, it is one of the best games in the Sega Master Library. It features better graphics and a deeper(not by much), more wordier storyline. It has a wide variety of monsters to fight and items to get. Both of which 90% percent of the time have counterparts in Zelda. 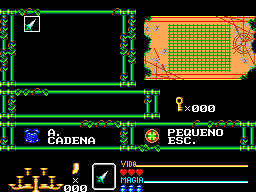 It has tons of secrets so the player should check everywhere using various items on just about every screen of the game. The only area this game lack in is sound and music. It doesn’t have the charm that Zelda holds for many gamers. 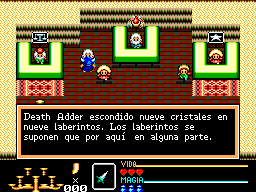 The point of this game is to collect nine crystals which are located in nine labyrinths in order to access the tenth and final labyrinth and Death Adder. 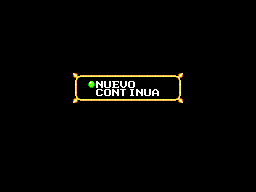 This is a Spanish translation of Golden Axe Warrior for the Sega Master System. Only the Title screen needs to be translated.